Two Local World-owned weeklies have been accused of “declaring war” on an independent newspaper group which launched two new rival titles five months ago. The Llanelli Star and Carmarthen Journal have both published a full-page advert comparing their circulation figures with those of the rival Llanelli Herald and Carmarthen Herald and encouraging people to advertise with them. The two Herald titles were launched by the publisher of the Pembrokeshire Herald, MegaGroup, in March this year, going up against the established Local World titles. 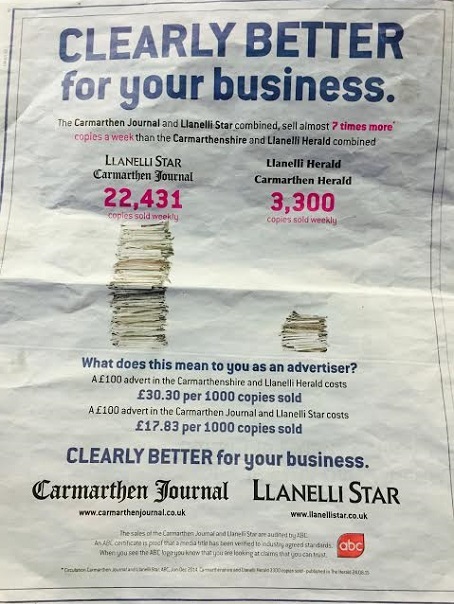 The advert published by both the Star and Journal this week compares their combined circulations with those of the Llanelli and Carmarthen Herald titles, saying they sell almost seven times more copies a week. It claims that the Local World titles sell 22,431 copies a week compared to 3,300 for the two Herald newspapers. The advert says this would mean that a £100 advert in the Journal and Star costs £17.83 per 1,000 copies sold, compared to £30.30 per 1,000 copies for an advert in the Herald titles. Thomas Sinclair, editor of the Herald titles said: “The Star and Journal seem to have declared war on us. “However, their adverts tell their readers that we are selling thousands of papers every week, and we will clearly put the message out we are getting bigger all the time. “The adverts in the Star and Journal are in my view self defeating. The ad is clearly aimed at businesses, but people who are smart enough to be in business will be smart enough to know that what our rivals have done smacks of desperation. The Herald titles have a cover price of 50p, while the Local World titles sell for 75p. Both the Star and Journal have declined to comment on the advert. Thus was it always and evermore shall be. Absolutely no idea what the fuss is all about. Of all the impudence, to try and fill a void by the growing proliferation of non-news! Hilarious in a sense, the new newspaper model of constant cuts to staff and quality can only work if there’s no competition that’s prepared to at least try and do it better than them, this will be the industry’s worst nightmare. It’s like antibiotic resistance but to UGC and content, I like it, I like it a lot. Am I the only one to see that the maths on this is way out? The Star and Journal has a combined circulation that is 6.8 times higher than the Herald series. Therefore the comparison cost should be 6.8 times lower for placing an ad in the LocalWorld titles, or £4.46 per thousand copies. A massive own goal if you ask me. Local World’s ad team have got the message right (we are better value), but have undersold it by a factor of almost seven. And if I was an advertiser I’d think twice about letting an incompetent team near my ad. It pains me that so few journalists, including the one who wrote this piece and didn’t pick up on the mistake, are numerate. A quick look at the figures should tell you something is wrong. £17.83 is roughly half of £30.30 – yet the sales figures are obviously a good deal more than twice as good. I honestly wonder how many stories go begging because journalists can’t see the obvious when it comes to numbers. I spy the hand of the Brains Trust which handles Local World’s marketing in this neck of the woods. It isn’t working here boyo – and it certainly won’t work in Wales. Have I missed the point or is this just a story about a competitor paper(s) opening up and the bigger boys putting their full weight behind closing it down? if so this isnt really news is it,its what`s happens all across the uk despite the big boys having their readers believe they welcome competition ,trust me ,in this neck of the woods they don’t and will do anything they can and at pretty much any cost they can to prevent a competitor succeeding. in my view its a far better policy to look to their own publications and improve them to reduce the chance of a competitor opening than try to crush opposition once it does. Yet more nastiness from the Nasty People. Still, I suppose if we don’t like it, we could always leave. The Power of the Positive. I suspect you get more space for your £100 in the Herald. as well. Good luck to the independents out there. How shallow journalists have become! They profess to believe in free speech, yet when competition rears its head they pull out every trick in the book to kill it off. The irony is that if there was competition, journalists would benefit more than most because it would give them a greater career choice. What are they supposed to do welcome the competition with open arms? Accept losing advertising revenue to a new upstart competitor without fighting back? Any decent business would be knifing them in the front like this and knifing them in the back by undercutting and putting them out of business through discounting and tying customers in. Hardly a “war.” More like a marketing promotion highlighting the difference in circulation which is perfectly acceptable. But, I bet the Local World advertising rates haven’t dropped 50% from when its papers sold 44,000. Jupiter, since when have journalists ever had a say on decisions like this? Journalists are always the least important people at a newspaper office, but we didn’t care because we just enjoyed the job. I didn’t care what a rival’s sales figures were, or what our advertising revenue was. At any self respecting newspaper office there will be a whole slew of advertising staff on 35k a year who smell like Paco Rabanne crawled up their backside and died, while in the corner there will be two reporters, both of whom have stubbled (even the woman) and eat beans on toast out of the micriwave for Sunday dinner – and that’s the way we like it. Hang on, that doesn’t add up. 22500 copies divided by a £100 advert is just under £4.50 per 1000 copies sold! Oops, I wonder which marketing genius is getting their ear bent this morning. How did they arrive at those figures? Herald series: £100 divide by 3,300 copies, x1000 = £30.30 per 1,000 copies sold. Correct. But then £100 divide by 22,431 copies, x1000 = £4.46 per 1,000 copies sold. Where did that £17.83 come from? Am I going mental or have they made themselves look worse than they actually are? I might have added that their desperate reaction shows how running scared Local World must be to the competition to have featured so much publicity aimed at advertisers; and it’s one big raspberry to all those commentators who think this is just a Silly Season story. Freedom of the press is under threat from within the industry just as much as from outside. Pathetic. They’re clearly rattled – so keep up the good work. Jeff…just seen your comment. I don’t want to take all the space on this page (and it’s lunchtime), but I will just say that it is time journalists did care. Open your eyes and look around. Writing is more than about thinking up silly gags. As the old saying goes, the pen is mightier than the sword. There speaks someone who hasn’t a clue and who is obviously from the commercial side of the industry, if they’re in the industry at all, and who sums up the mentality of why once decent papers are now stuffed with cheap jack ‘ do you a deal mate’ ad fillers and bad ads just to get cash in sold by people who only know discounts deals and ‘late space’ as opposed to selling the benefits of their own publications , presumably his papers have no benefits and. nothing going for them. Jupiter, in Pembrokeshire the Herald are rather prone to mislead local businesses by comparing their readership with their competition’s circulation, thereby giving a false impression to someone not familiar with the two terms. I’m assuming the same in Carmarthen and that the Journal are fed up with it. And this is what we can see they are saying in public. Imagine the conversations with advertisers in private. What a rotten lot. CLEARLY BETTER buy themselves a calculator. Jupiter – What planet are you on? Jupiter, I’ve won awards and recently had a piece in The Guardian, I know my way around writing and journalism thanks. I still don’t care about advertising sales. I’ve said this before and I’ll say it again, for potential advertisers doesn’t matter how many copies of the paper you sell or how many visitors you get to your website. It’s about whether you reach the right audience for them! Since 2007, the advertising budgets of businesses of all sizes have been trimmed and much more carefully spent. Many SMEs have begun treading carefully into digital platforms, such as Google or Facebook, and even if they’ve not actually managed it for themselves, they now have a much better idea on how to review their ROI. The stats can be endless but are much more valuable than the ‘scattergun’ approach of advertising in a newspaper. If your have clear evidence via a coupon, or even anecdotally, that the newspaper is right for you, then great. However, advertisers are becoming much smarter and they can arm themselves with a whole raft of data about how successful a particular advert or campaign is online. They are starting to expect this from all forms of traditional media too and, being unable to be as comprehensive or accurate, they are much more reluctant to spend in print as they used to. Any marketing campaign should, ideally, cover a range of media, including print, but when budgets are tight and targeting is vital, advertisers want to know that they’re spending their money in the best and most affordable way possible. The only thing in favour of the Local World titles here is that I presume they would be competing for the same audience as the Herald papers. However, if there are differences and, as a business, I KNEW that my target market was the 3,300 people who bought the Herald, I’d probably be happy to pay them more rather than advertise to 22,000 people who aren’t interested. Absolutely right, Oliver. It is about target markets, not just the bubble of numbers spewed out by some newspapers and websites. Discerning potential advertisers quickly see through the pathetic attempt to bamboozle them with “readers per copy” or “page imprints”. For all those double glazing, motors, restaurants businesses advertising in papers – its not about where they spend each £100 on advertising, but what happens as a result. I hope they are embarrassed and someone has been sacked over this quite laughable and idiotic error. Either their CRM database is so poor they are unable to target the intended recipients in a strategic manner or else this is pointless, sabre-rattling to make them feel better in their own tiny minds. Reader, you decide! Hi Paul: You miss out the fact that the ASA told Newsquest to get stuffed about their complaint against a rival publication that kept on beating them to real news stories. It cost one of their marketing bods their job when they realised they’d underestimated the competition. Guess where they’re working now…. could it be Local World? Identifying and delivering an audience to s target market has been the blueprint fur a range of quality magazines that have launched in Norfolk on the back of this kind of fudged guff from the local regional group. Years of cpmacency, poor service,scatter gun sales and churned out ‘adfeats’ put in just to grab money and with no worth to the advertiser and of no value to the reader have made it easy for the new publications to launch and thrive, often staffed by experienced ex regional people. This is just another desperate mud slinging act from the bully boys who see any opposition as a threat rather than looking at the root causes as mentioned previously. I think everyone should be looking into the past history of the Herald. why it even came into being and the ‘ editor ‘ and who is the owner. Might reveal also the real reason for the newspaper in the first place. All rival business have to survive and some competition is always good. but dirty tricks and false propaganda ? 2014, BEFORE the rival paper had been established. My planet, young lady, is called Reality. You ought to go there, sometime! I have just caught up with this item, however, all I can say is that newspaper bosses always become precious and silly when another company parks its tanks on their prized patch. It wasn’t that long ago that the Cambridge First v Cambridge Now spat gripped the fine university city. Now it is a case that both are Cambridge Gone!